Jason Miles, DJ Logic, with Karl Denson, Me'shell Ndegéocello, Herb Alpert, Billy Martin, Vernon Reid, John Popper, Bernie Worrell, Cyro Baptista, Christian Scott and others! Global Noize is a ground-breaking jazz/funk/world fusion project that mixes DJ Logic's turntable wizardry with irresistible funk grooves, impressive jazz solos, and vocal/sound textures from around the world. 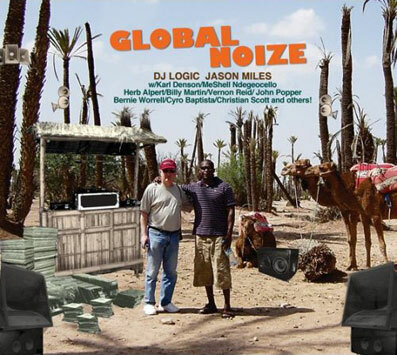 Global Noize is co-produced by DJ Logic and Jason Miles. DJ Logic is one of the world's best-known and most sought after DJ/mixers. His collaborations with The Grateful Dead's Bob Weir, Blues Traveller's John Popper, and Living Colour's Vernon Reid, along with his own solo recordings, have given him a large world-wide base in the jam-band, club and alternative music worlds. Jason Miles is noted and respected for his work with Miles Davis, Marcus Miller, and Luther Vandross. The signs are everywhere: MTV launches a channel on the Arabian Television Network. African hip-hop groups mix the postures and style of American rappers with homegrown lyrical messages and M.I.A., a Sri Lankan refugee now living in Brooklyn, scores one of the year's most critically acclaimed albums--sound bites recorded around the world mixed in an electronica blender with hip hop beats. Multi-tasking cell phones, cheap lap tops, Kindle Ebooks, YouTube, internet radio, and of course the multifaceted internet itself, have engendered a cultural interchange of unprecedented scope and speed. Music, which resonates across every cultural barrier, leads the charge. The result is a grand "global noise," a spectacular sea of interchanging and mutating beats, sounds and melodies from all directions. It is precisely that reality that Jason Miles and DJ Logic set out to capture with their collaboration Global Noize. Keyboard extraordinaire Jason Miles, who has worked with everyone from Miles Davis and Luther Vandross to Ivan Lins, and Turntable guru DJ Logic, who has collaborated with diverse artists like Phish, Vernon Reid, ?uestlove and Don Byron, join forces on Global Noize to create a thrilling mix of free-wheeling tracks that take listeners on a wide-ranging journey through the minds of some of creative music’s most innovative musicians such as Meshell Ndegeocello, Billy Martin (Medeski, Marin & Wood) , Vernon Reid (Living Color), John Popper (Blues Traveler) Cyro Baptista (Herbie Hancock), Bernie Worrell (Talking Heads, Parliament Funk), Karl Densen (Tiny Universe, Lenny Kravtiz). "This is a special project as the world is a Global Noize and we need to come together in difficult times and great music has the power to do this," states Grammy Award-winning and Emmy nominated keyboardist, producer and composer Jason Miles. "The artists and musicians on the project represent a great diversity and this is what the world is really about. The beauty in this diversity is something that we all need to appreciate." Global Noize is a project that has long been brewing in Jason Miles’ mind but the idea was solidified when he got a call from friend his DJ Logic last year to join him for a performance at the Blue Note in NY. "On that day I had a horrible root canal and was mourning the loss of a close relative. I thought that this could be just the tonic I needed to pick myself up," recalls Miles. The night was exactly what Miles had hoped and from this experience he knew that he and Logic had a special connection. The duo later worked together in Morocco at The Casablanca Jazz Festival and had the opportunity to venture off to Marrakech. Miles shares, "We went through life-altering experiences. It was so new to us -- mysterious, crazy and another view of the world. We both knew we had to make this project happen. The picture on the CD over of the both of us with the camel in the desert says it all!" Global Noize is an organic, free-spirited sonic brew of some of the best elements of jazz, funk, electronica and world fusion – it is music without borders. Miles says, "We started with Cyro Baptista and Billy Martin jamming in the studio and built up the tracks from there. Logic and I pooled our musical resources and had some of the best cutting-edge artists play on the record." From the album’s opening track, "A Jam 4 Joe" (dedicated to the late piano/keyboard wizard Joe Zawinul) to its concluding statements on "What I know," Global Noize takes listeners on a mind-bending, global adventure featuring all original compositions. "A Jam 4 Joe" features Logic and Miles along with guitar wizard and founding member of Living Colour, guitarist Vernon Reid, musical chamelon and bass player Meshell Ndegeocello, percussion maestro Cyro Baptista and the stunning Indian vocal diva Falu. The groove is relentless and is supercharged with magnetic energy. Bernie Worrell joins the mix on "Spice Island’ playing the clavinet and organ. Worrell, who is best known for his contributions to George Clinton’s Parliament Funk and The Talking Heads, lays down a serious funk heavy groove that reverberates throughout the track. The slow-burning "The Souk" highlights Falu and Blues Traveler’s John Popper on the Harmonica in a seductive dance with one another, along with percussionist Braheim. "We were lucky to get John Popper on a day off in NYC," adds Miles. "He just kills on the ‘Souk!’" "Quera Dancar/I Wanna Dance With You" is a cool breezy Bossa Nova that beckons you to move your hips and dance to the music’s delight along with Brazilian bombshell and chanteause Vanessa Fallabella, celebrated Brazilian guitarist Romero Lubambo and season jazz bassists James Genus. Global Noize, which DJ Logic describes as "a hip and eclectic musical journey crossing all boundaries," further delights with such tracks as "Dar’abesque" (named after the villa Miles and Logic inhabited in Marrakech) featuring trumpet icon Herb Albert. "When I got the track back from Herb Alpert," confides Jason Miles, "I knew that any musician who had imagination and a great musical voice would love to be a part of this. Herb just really brought the track to life." "Bollyhood" is an ear catching trip-hoppy track showcasing the haunting vocals of Falu and "Planetery Beat" joins multi-instrumentalist Karl Denson and guitarist Dean Brown together for a soul jazz romp with killer break-beats and groovin’ horn riffs. "Having Karl Denson involved with this album made us happy because we knew there would be great playing, brilliant horn arrangements as well as fantastic compositions all at the same time." Christian Scott is showcased on "Exotic Thoughts," an ethereal meandering piece featuring the young hot trumpeter along with guitarist Carl Burnett and Tabla player Suphala while "Pool of Honey" is as sweet as its title with its uptempo swinging melody and feel good vibe featuring Burnett and Suphala once again along with Karl Denson on flute. "Christian Scott is one of the most exciting young artists on the scene," states Miles. "He really stepped up and showed what a young cat at the beginning of his career has got going on." "Spin Cycle," brings back a 70s funk flavor with its insatiable drum licks from Gene Lake and "What I Know" features spoken word artists Aline Racine. Jason Miles concludes "When I hear music I love I want to be involved with it. It would be boring for me to stay in one place musically so I love to explore different music. I know Miles Davis felt that way and I'm just trying to keep the grooves hot, the melodies great and collaborate with the best artists I know. Hopefully Logic and I will be bringing Global Noize to the world and show people our musical vision." Global Noize will make its live debut this Spring. Don’t miss the opportunity to catch this unique experience in a City near you!